Not that I’m complaining. I wouldn’t have missed any of this week’s social contacts. I’m just not used to this many in so short a time. One week ago today, we had the annual Walker Thanksgiving here at Blithering Heights. Everyone was on their best behavior, no fights broke out, and I didn’t ruin the turkey. So no complaints there. On Monday morning, I drove my brother and his wife to the airport. They were accommodating and undemanding, and the only problem was that it was snowing. Not heavy snow. Quite light, in fact. But the temperature was precisely calibrated to turn that snow to ice under everyone’s car wheels. So we crawled along Highway 62, Minneapolis’ venerable crosstown artery. I’m sure Bob Dylan crawled on 62 in his time, and F. Scott Fitzgerald would have if he’d stayed around town long enough to see the thing built. We were in plenty of time for the flight, but I was late to open the library at work. This is always a distressing eventuality for the students at the Bible school, but as far as I know none of them actually required counseling. 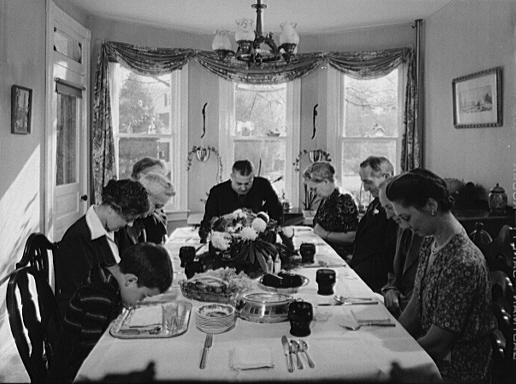 Thanksgiving at the home of Earle Landis, Neffsville, PA, 1942. Photo by Marjorie Collins. This was just eight years before my birth. I am that old. My heart has greatly desired this Thanksgiving. Not because of my fitting gratefulness; heaven knows I’m as ungrateful as the next man, and a lot more ungrateful than that other guy next to him. No, this holiday season has been a benchmark for me ever since I started graduate school. By Christmas I’ll be done with classes (assuming I don’t flunk one unexpectedly), and even now the pace is slowing down. Neither of my instructors seems all that interested in cramming work into the last couple weeks. I’m essentially done with my labors for one class, and the other doesn’t have a lot left except the final test. That will be annoying, but there’s nothing I can do through anxious care to make its span a cubit less. So here I am, on the verge of being done with the bulk of it (the question of a Capstone Project remains up in the air), breathing afar off the balmy zephyrs of liberty. For more than two years I’ve been squeezing my life into whatever spaces the academic template overlooked. Soon I’ll have evenings free again. I’ll be able to relax (a bit) on weekends. And – praise to the Almighty – I’ll be able to work on my novels again. I even sat down the other night and wrote a scene that had impressed itself on my mind. It’s an important scene, one that reveals the heart of a major character, and should guide my portrayal. So I’m thankful. Frankly, thinking back, there were long bleak stretches when I didn’t see how I could get this far. Either I’d fail or the stress would kill me, I figured. As with so many things in life, the Lord’s iron purpose was to make me walk through it, get stronger, and learn what I was capable of. Wasn’t it Tevye in Fiddler on the Roof who asked the Lord to please not bless him so much? Have a blessed Thanksgiving. I expect I’ll be hanging around here a bit more from now on. I’ve used that quotation for Thanksgiving before, but it was a long time ago. On the old web site, I think. Anyway, I like it. This is one reason, I suppose, why Jesus tells us to cast no thought upon the morrow. Worry kills thankfulness, and lack of thankfulness destroys our spiritual perspective. So have a blessed Thanksgiving. I hope you spend it with people you love. Or, alternatively, that you love the people you’re spending it with. Stephen Paulus’ “Pilgrims’ Hymn” from his 1997 opera, The Three Hermits. Jared has seven great ways to crush the Thanksgiving spirit, such as freaking out over everything, like a late family guest, and practicing practical atheism. Bill talks about communal living and productivity. One of my earliest professional experiences involved leaving a job at a government-run municipal utility to take a job at a private-sector energy company. At the utility, it didn’t much matter what you did, you were going to get paid and keep your job. There was a lot of waste, shoddy work, and sloth at that company. Don’t get me wrong, I worked with good people. But the very structure of the place was set against big productivity gains, risks, improvements or innovation. One of our most popular posts, not by the comments it drew but by the traffic it has attracted over the years, is this story from September 21, 2006 about a microwave and a turkey. It’s linked from an urban legend page which talks about a pregnant turkey prank, which may or may not have happened despite being believable (but that page has been removed in the ever-changing Internet). If you haven’t read either story, here’s your chance to catch up. A home to live in. That blessing is compounded this year by the fact that I was recently approved for refinancing, which ought to make my financial circumstances a little more comfortable in 2010 (which I say we should all agree, ahead of time, to pronounce “Twenty-Ten”). Jerry Nordskog and the folks at Nordskog Publishing, who took a risk on getting me back in print again (you do know I have a book out, don’t you? You can buy it here. Or here. The perfect Christmas gift for everyone on your list!). The people at the schools of the Association of Free Lutheran Congregations, who continue to permit me to play Eccentric Librarian in their beautiful facility. A good church to attend, not too far from where I live. My family, for having the patience to put up with me as we gather a couple times a year—this Saturday being one of them. Phil, for giving me the keys to the blog, and not complaining too much about the dents and scrapes I put on the fenders. Thanksgiving . . . is, perhaps fundamentally, the season of hope. In this season, maybe the current condition of the global economy will focus Americans on essentials: family, nature, eternal verities, a new frugality, a simpler life. With its focus on money and “things,” materialism diminishes our appreciation for what we have. It fosters frustration, exasperation, even anger at what we don’t, and a redefining of wants into necessities and have-to-haves. And here’s a story of self-reliance. In other news, a Wal-Mart stock clerk was trampled in New York by a crowd of early shoppers. A pregnant woman was also knocked down. The crowd took down the front doors too. I think the store should have been closed and all of the shoppers thrown out of their ears. By the way, I’m thankful for you. I don’t think I’d still be here, if I were the only one in this room. I’ve spent the day alternating between stretching out on the sofa with a book and cleaning the house (or vice versa) in preparation for Saturday’s invasion. I took time this evening to do my bill paying, which I usually do on Thursdays. Since I’ll be able to put them in the mail again tomorrow, I thought I might as well keep up my usual routine. I have a cheap pocket knife that I’ve been using as a letter opener ever since the old pewter letter opener that belonged to my dad disappeared unaccountably. I was in the midst of bill paying when I got up to do something (I went to the bathroom, actually, but you don’t want to know that). When I got back to the desk, the pocket knife was missing. I retraced my steps on the very short trip, and checked all around the desk, and I can’t find the bloody thing anywhere. I know whom to blame, of course. It’s the elves (or nisser, in Norwegian). It’s always the elves (or nisser, in Norwegian). Yesterday, I thought I might live blog my early Thanksgiving morning, which isn’t the right use of the term “live blog” because no one was awake, I had nothing to do, and I doubt you were here wondering when the lit news is coming. The coffee wasn’t even made. I could update you on what’s coming over an antique radio I have behind me. It’s a Japanese made Viscount “Stereo Solid State” with volume control for both left and right speakers and something called “MPX” on the AM/FM switch which seems to enhance the sound for FM radio. I didn’t catch the name of the composer whose music is playing now, but it’s a work about war and peace in Switzerland. Ah, Copeland’s Rodeo is on the radio now—Classical 90.5 out of Collegedale, TN. Rodeo makes you think of beef, doesn’t it? I don’t see why this should ruffle anyone’s feathers, but then I don’t understand why so many will argue for their dog in a fight when they have no personal investment and winning an argument will mean nothing at the end of the day. That’s why I don’t favor one sport team over another. Anyway Lars said yesterday, we have much to be thankful for. Today, I’m thankful for the rain that fell yesterday evening. The southeast needs a lot of it, and I see rain south of us in middle and south Georgia. That’s a blessing. Perhaps the Lord will not take us through a very dry valley into next summer, but even if he does, I know he will leave us. He will not leave his people, that is, because He works all things together for the good of those who love him, who are called according to his purpose—those whom he foreknew and predestined to be conformed to his image. All things, like droughts and freakish jellyfish attacks on Irish salmon farms. That’s a huge thing to give thanks for. Bryan Chapell preached a great sermon on prayer which touches on this idea (MP3 link). What else might an American Christian thank the Lord for today? Good coffee comes to mind, but I’ve drunken all I brewed this morning. Other things? Good roads, stable houses, reliable heating and air conditioning, reliable transportation in various forms. Plenty of food of all kinds. Computers and networks for writing and talking to each other regardless the distances. These are blessings from the Lord of heaven and earth. Because people in our have respected the Lord’s commands, generally speaking, we expect people to keep their commitments, to do a job properly, to deal with us honestly. I know we have become more cynical of these things, and buyer beware is still a good principle, but I wonder if our justifiable cynicism comes to us as our countrymen drift toward a secular mindset and liberal doctrines. Maybe if we “undertake for the Glory of God, and Advancement of the Christian Faith, and the Honour of our King and Country” our lives in this country, as the Mayflower pilgrims did, we would see more hope for the future of this life as well as hope in the life to come. I think I’m hearing the foreshadowing toll of the dinner bell. I must go. Hope you have a wonderful Thanksgiving, Faithful Reader. I don’t have any particular plans for the day, but pity me not. My brothers and their families will be gathering here at Blithering Heights for a feast on Saturday. Once again I shall test myself against the wily domestic turkey, to learn which of us is the better man. I may post over the long weekend. Or I may not. I have several things to say about Thanksgiving, and they don’t all hang together terribly well. But when has that ever stopped me? For some reason I’ve been thinking today about the old people of my childhood. Not merely my parents. Not even my grandparents (who are much missed, one and all). I’m thinking of the really old people I met in church as a child, incredibly tall people (from my perspective) who dressed in a formal manner, moved slowly, spoke with accents, and seemed possessed of the wisdom of the ages. And in a way they were. Those were people who grew up in a world full of Civil War veterans. They clearly remembered the Spanish-American War, and high buttoned shoes, and gentlemen in derbies and handlebar mustaches. They remembered a time when you measured distance (to loosely quote C.S. Lewis) by the time it took to walk from one place to another (or at least the time it took to go in a wagon or buggy). Some of them were immigrants. They remembered what it meant to come to a country where it didn’t matter what class you were born in, or what your father had done for a living. In America, you could be anything you wanted to be! They remembered times of being genuinely uncertain whether the summer’s food would get you through the winter. They remembered prairie fires, and locust clouds, and diphtheria epidemics. They remembered times when things to read were hard to come by. When you got your hands on a book, or a magazine or a newspaper, you read it front to back and then read it again. And then thought about it. Because it might be a while before you got anything more to read. They were probably all racists, by our contemporary standards. They thought going to theaters and dancing were mortal sins. They thought America started going downhill when we ended Prohibition. But all in all, I think they were better people than we are. They’d experienced life in a skin-to-skin, scratchy, smelly, painful manner from which we’re far removed today. They knew how to be thankful, because they’d lived with genuine want. I miss them. I wish they were here to celebrate Thanksgiving with us; to influence us to be quieter, more reverent, more grateful. All you’ve got to bring you down today is me. And if that’s not something to be thankful for, I don’t know what is. When the Pilgrims arrived in Massachusetts in 1620, lobsters were so common all you had to do was stroll down to the nearest tidal pool and pluck them out by the bushel. But the Pilgrims wanted meat, not fish — not even fish as succulent as lobster. Very quickly familiarity bred contempt: The better class of colonists scorned the crustacean as suitable only for the poor. In his journal for the year 1622, William Bradford, governor of the Plymouth colony, recorded the landing of a boatload of new colonists from England. Their arrival was a thrilling event, yet Bradford confessed that he and his fellow Plymouth residents were humiliated that they had nothing better to offer the newcomers than lobster. Also on The American Spectator, Jay D. Homnick riffs on Georgia’s prayer for rain. “Pray today, give thanks tomorrow. Remember also that prayer is not only a means to an end, as Maimonides explains, it must catalyze each of us into reflecting upon our priorities,” he writes. “God said, I am tired of kings, / I suffer them no more;” Emerson has an interesting poem here, Boston Hymn. Gaius writes about the Pilgrims early attempts to live communally. This appears to be within the first seven years of their landing in America. According to what I’m reading, the pilgrims’ voyage was funding by London investors who required they work for them for seven years doing whatever profitable work they could find. At the end of those years, the survivors would receive a small share of the profits, but everything belonged to “the common fund” or that of the investors. Even the clothes they wore were owned technically by the men in London. Perhaps that’s why the colony started with a communal attitude.